View Poll Results: Are you getting this game? This game is going to be INSANE!!! 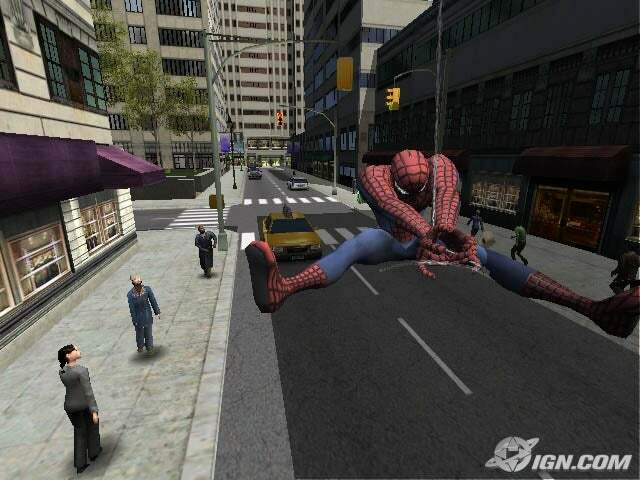 A free roaming spidey game in the big apple! I'm lovin' this game! In the pics you even see MSG! Is anyone else excited for this game? Last edited by Get Me Coffee; 05-11-04 at 05:11 PM. All I can see in the pics is a tiny little spider-man running in the middle of a white background. The pics are too tiny - couldn't you find bigger ones? Those pics are huge...maybe you'll need to expand them. Doesn't look like anything special, imho. Looks like a typical license based game. You guys are CRAZY! Nothing special!?!?! This is Spidey in free roaming aka GTA style! Plus they digitized NYC!!! I thought Grand Centeral was amazing in the first game. Such detail...Geez the billboard where the departures are where perfect, white plains, Brewster...awesome. Just thinking about playing in NYC with this kind of detail is going to be insane. I don't know man, I still can't see nothin but red xs in the first post and those small screenshots aren't doing anything for me. You saying GTA and digitized nyc has me interested though. But you could've said 'skittles' and gotten the same effect. I suppose I'll check it out, but with all the other games coming out, hard to notice another spidey game. Oh and the game looks cool too! This is Spidey in free roaming aka GTA style! I feel like I've heard too much promotional fluff touting a game being "GTA-style." That doesn't excite me any more because I feel like it's been beaten into the ground. I'm not expecting anything, it is another Spiderman game, afterall. Maybe if it was open ended and non-linear, I'd be interested...but chances are that won't be. I can't tell if the screenshots depict a gritty new style for Spidey... or just bad magazine scans. HAVE TO TOTALLY DISAGREE ABOUT THE SKITTLES GAME! Maybe if it was open ended and non-linear, I'd be interested. Isn't that kind of implied by "GTA-style"? Get Me Coffee does seem to have some weird obsessive thing going on though. Hell yeah, I'm in! The first game based on the movie was awesome. So that, plus being able to pretty much go anywhere; I'm buying it the day it comes out! Sigh!! I guess there are still people who thinks that a game is awesome just because it looks good on paper. Pluhzeeeee!!!! Muahahhahahahahahaha!!!! The first game based on the movie was awesome. Aside from the stealth levels, I agree -- I really liked it and will probably grab the sequel as well. Word, some of those stealth levels felt very out of place. This game is looking VERY much improved over the first I may not pre-order it but I'll definately rent it . Last edited by Get Me Coffee; 05-10-04 at 08:54 PM. I won't be just because i hated the first one on the Dreamcast. The camera always felt like it was maliciously working against me. Eventually i did beat the game though just because i was stubborn enough..... the training levels ruled though because of Bruce Campbell. Edited to add: Well, perhaps the first "movie based" Spiderman game wasn't on Dreamcast... but there were a couple of cool, similar spidey games that were... and on PSX also. Last edited by cheapskate; 05-10-04 at 10:08 PM.